Current development policy, in general, is noticeably giving more space for the involvement of private sectors as compared to the previous ones. Similar is the case for the Netherlands and the UK starting from 2010. Both coun-tries, despite of having their differences, have adopted a similar development aid policy under the Conservative-led government coalition which was differ-ent from their previous government coalitions. 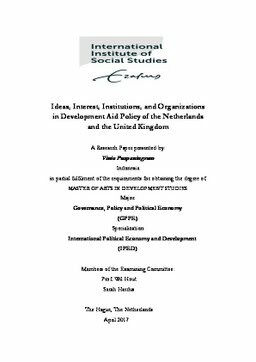 In light with that, this paper tries to elucidate and compare the role of ideas, interest, institutions and or-ganizations in shaping development aid policy from the late 1990s to 2015 by using Lancaster’s and Campbell’s analytical framework.